Concerning Islamism: Hands On or Off? Shadi Hamid of the Brookings Institute is an insightful analyst of Middle Eastern affairs. Of Islamists in particular, he notes they often moderate under moderate repression, as witnessed under Mubarak. But intrinsically he finds them to be ‘illiberal’ in terms of Western values, though there is a strong undercurrent in his writing that the values of democracy demand they must be allowed to govern anyway. Writing in the Atlantic, he chides President Obama’s ‘do-nothing’ foreign policy for main of the region’s ills, including allowing Egypt’s military remove the Muslim Brotherhood’s Morsi in a coup d’etat that eventually resulted in hundreds dead during the bloody suppression of the sit-in protest at Rabaa. America’s relative silence was no accident. To offer a strong, coherent response to the killings would have required a strategy, which would have required more, not less, involvement. This, however, would have been at cross-purposes with the entire thrust of the administration’s policy. Obama was engaged in a concerted effort to reduce its footprint in the Middle East. The phrase “leading from behind” quickly became a pejorative for Obama’s foreign-policy doctrine, but it captured a very real shift in America’s posture. America’s unwillingness to play such a role increased the likelihood that the Muslim Brotherhood, empowered by its conservative base and pressured by its Salafi competitors, would veer rightward and overreach, alienating old and new allies in the process. As demonstrated in Egypt, the governance failures of Islamist parties can have devastating effects on the course of a country’s democratic transition. After coming to power in 2002, the Islamist-rooted Justice and Development Party (AKP) passed a series of consequential democratic reforms. The prospect of membership in the European Union helped incentivize the AKP to revise the penal code, ease restrictions on freedom of expression, rein in the power of the military, and expand rights for the country’s Kurdish minority. But when the threat of a military coup receded, and negotiations with the EU faltered, the AKP government seemed to lose interest in democratization, increasingly adopting illiberal and undemocratic practices. In 2006, the Brotherhood’s general guide, Mahdi Akef, told me angrily that “of course” the Brotherhood would cancel Egypt’s peace treaty with Israel if it ever had the chance. Of course, Morsi did not cancel the peace treaty, though Hamid notes he once called Jews ‘the descendants of apes and pigs’. The Muslim Brotherhood realized its red lines, and even played a functional role in helping broker peace between Israel and Hamas in Gaza, he says. But I not sure what is his overall argument, or philosophy. He notes Obama’s hands-off strategy, but earlier in the article he criticizes the hands-on support given to the region’s dictators. There is no either-or, of course, and it appears his preference is for the democratizing pressure from the Bush administration circa 2005, that opened up political space in the region, including Egypt, and gave Islamist entities – among others – wider space to operate. But concerning that ‘illiberal’ nature of Islamism, is his solution altogether continual moderate repression? Whether from domestic or international agents, that seems open to criticism as well. Hamid levels it himself at the Egyptian military [SCAF] after the revolution and through the beginnings of Morsi’s presidency. 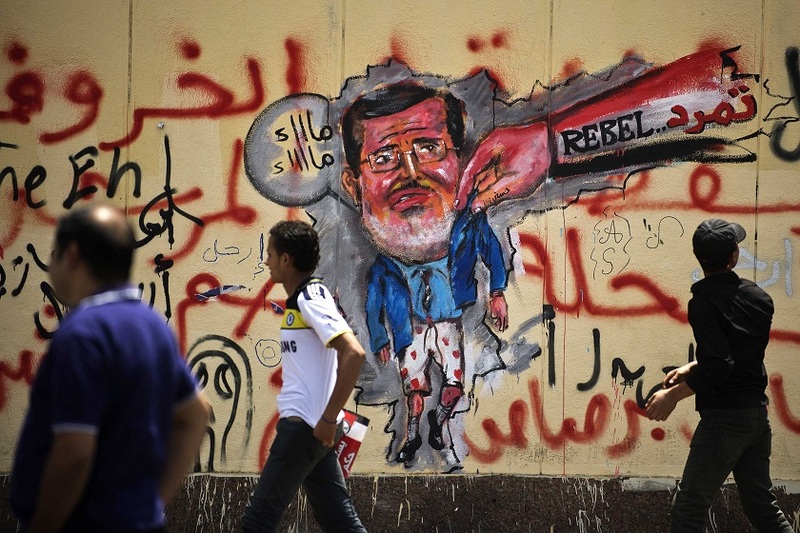 SCAF, though, grew increasingly autocratic, culminating in one very bad week in June 2012 when the military and its allies dissolved parliament, reinstated martial law, and decreed a constitutional addendum stripping the presidency of many of its powers. Hamid calls these ‘egregious violations of the democratic process’, and there is little argument. But it can also be said they were among the few means left of moderate repression to constrain Brotherhood illiberalism. As already noted above, without international pressure from the US the Brotherhood went headlong into the arms of Salafis. Modern world peace is based strongly on the idea of national sovereignty. Domestic repression is not healthy, while all sorts of pressure exist legitimately in the realm of international relations. Hamid alludes to it as ‘dependency’. As long as Arab countries are dependent on Western powers for economic and political survival, there will be limits to how far elected governments, Islamist or otherwise, can go. But if this is his belief, given all that Islamists have said about both domestic and international ideology, should they be given an opening at all? Why risk their partial empowerment? If their moderation came only from modes of repression, will not a true nature reveal itself when no longer constrained? These are not comfortable questions to ask, let alone answer. But I am curious about Hamid’s answer. UPDATE: Hamid has been gracious to respond by Twitter. Below are his comments.
.@jnjcasper If liberalism & democracy in MENA come into conflict, I think we, as Americans, should generally prioritize the latter 1/?
. @jnjcasper I discuss some of my starting assumptions in the study of Islamists in this PBS @Newshour piece: https://t.co/o5hc3pD8NK 2/?
. @jnjcasper Yes, I'm not totally comfortable w- some of my own arguments re: repression, but I have to faithfully reflect my findings 3/?
. @jnjcasper My arguments abt moderating effects of repression purely descriptive. Even w- "positive" effects, can never be justified 4/?